Nepal, being mountainous, seismically active, landlocked and underdeveloped, faces a multitude of development challenges and, as a nation, is extremely vulnerable to the impacts of climate change, especially those related to water resources. Climate change is already being felt and is increasingly being accepted as a major issue facing Nepal (NCVST 2009; ICIMOD 2011; Xu et al. 2009; ICIMOD, 2013). General climate change trends have already been corroborated by ground-level observations of various communities, yielding a basic framework of identified and projected change in Nepal (Bartlett et. al. 2010). Poor and marginalized people, in particular, are facing many difficulties. The 2011 census listed the population as belonging to 125 caste and ethnic groups, including 63 indigenous peoples, 59 castes (including 15 Dalit castes), and 3 religious groups. The indigenous nationalities (Adivasi Janajati) of Nepal comprise 35.81% of the total population of 26.5M people. The marginalized indigenous communities are the most vulnerable to the impacts of climate change. This study looks at the impact of climate change on the Majhi community in Bodgaun village, located in Bhimtar Village Development Committee of Sindhupalchowk district in Nepal. 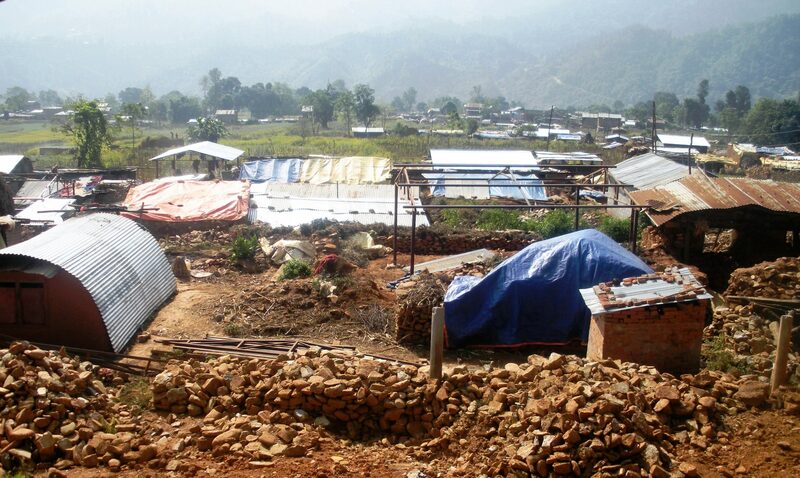 The people of Bodgaun lost their families, their houses, properties and everything they held dear and important in their lives due to Nepal earthquake in 2015. While reconstructing villages and re-establishing hope after the disaster, the issues of impacts of climate change came into sight. These impacts are adding significant stress to a community already devastated by natural disaster. The direct translation of Majhi into English is ‘fisherman’. The Majhis are one of the indigenous peoples of Nepal - having their own language, dress, culture, etc. with ancestral occupations of boating and fishing. There are about 18,000 Majhi people in Nepal. Most of the Majhi people live below the poverty line, with the economic status of the Majhi, in general, being very poor. They often do not have sufficient land for agriculture, resulting in an impoverished quality of life and minimal ability to absorb crop and livelihood losses, thus making them particularly vulnerable to impacts of climate change. Bodgaun is a village located in Bhimtar Village Development Committee of Sindhupalchowk district in Nepal with a Majhi population of 2,000 in 350 families. The majority of the people of Bodgaun now depend upon animal husbandry and agriculture for survival rather than the ancestral occupation of fishing and boating. This is because the traditional occupation of fishing can no longer support their livelihoods due to increased population and thus reduced fish yield per person. The people now rely on agriculture and animal husbandry, laboring jobs (to lift sand and gravel from the river) and remittance to provide income. The land is not very fertile and despite the development of new technologies, people cultivate crops in a traditional way, resulting in very low yields. Observation of agricultural productions for two years: This is based on the perception of farmers only, yield measurements were not taken. Observation of river cutting during two monsoon periods: The agricultural land near the river has been observed to be flooded every year. This is based on the perception of the community and recent flooding of paths/trails and access roads. Household survey: These were undertaken household by household and recorded the characteristics and outlook of the population including demographics (age, gender, family size), literacy levels, income sources, use of sanitation, the impact of and outlook for damage to buildings following the earthquake etc. Community meetings: These were unstructured community gatherings where the needs and feelings of the community were expressed. Social impacts e.g. disturbed harmony in family, early marriage, dissatisfaction induced alcoholism etc. Regarding changes in rainfall the community noted that there was a trail through the land to reach the village which was flooded in the past year, inhibiting access to and from the village, and that a rough road to reach the river for collecting rubble and sand for building has also recently flooded. 85.5% of the community gained their income from agriculture and animal husbandry, with 5.9% gaining income from labor and remittance. The majority of the people are illiterate, and this is more prevalent amongst women than men. Those who are literate mainly have only received primary or secondary level of education. In general there is a very poor condition of hygiene and sanitation with few households using water purification techniques and many households lacking access to a proper toilet. This is contributing to an increased occurrence of waterborne diseases and diarrhea. The community is increasingly turning to wood and tree-cutting as an energy source, which may result in environmental degradation. The community used to produce biogas from animal husbandry and toilet waste, however both sources have been loss and/or devastated by the earthquake. 69.3% of households are currently struggling to rebuild their homes due to their poor economic background and government stipulation that they were not allowed to build the new houses in the old style, which used mud and stones. The full survey report can be downloaded from the right-hand column of this page. There are several communities in Nepal that are facing similar or severe challenges due to climate change impacts. Many other communities have reported to have problems with paddy farming due to uncertain rains, increased crop diseases and pest attack, water induced disasters like floods and landslides due to extreme rainfall etc. There are some initiatives taken by government and international agencies on adaptation but the initiatives often appear ineffective in making real change in the livelihoods of the people. A collaborative, strong and long term effort is crucial to protect people, communities and environment. Moreover, many local people and communities may not understand the relationship between recent events and climate change, or in many cases the impacts of climate change are misexplained. Expert intervention in these areas, research, studies and implementation of results can make the life of people easier. ICIMOD (2013) Policy and institutions in adaptation to climate change: Case study on flood mitigation infrastructure in India and Nepal. ICIMOD Working Paper 2013/4. Kathmandu: ICIMOD . NCVST (2009) Vulnerability through the Eyes of Vulnerable: Climate Change Induced Uncertainties and Nepal’s Development Predicaments. Institute for Social and Environmental Transition-Nepal (ISET-N), Kathmandu. Xu J, Grumbine RE, Shrestha A, Eriksson M, Yang X, Wang Y, Wilkes A. The melting Himalayas: cascading effects of climate change on water, biodiversity, and livelihoods. Conserv Biol. 2009 Jun; 23(3):520-30. doi: 10.1111/j.1523-1739.2009.01237.x.